Tom Nee conducts a UCSD Department of Music concert in 1980. In his role as a conductor of both UCSD ensembles and La Jolla Symphony & Chorus, Nee built an audience for new and experimental music by UCSD composers such as Will Ogdon, Robert Erickson and Roger Reynolds. Thomas Nee, who joined the faculty of UC San Diego’s department of music in 1967 and helped shape the innovative program, passed away July 7. He was 87. Along with founding faculty Will Ogdon and Robert Erickson, Nee was mentored by composer Ernst Krenek at Hamline University in Saint Paul, Minnesota. Nee advocated Krenek’s free approach to music and education. Nee became artistic director and conductor of La Jolla Symphony (now La Jolla Symphony & Chorus) in 1967. He remained in that role for 31 years, leading the symphony through pieces by UCSD composers like Ogdon, Erickson and Roger Reynolds. Nee also brought talented student musicians into the orchestra, where they gained valuable experience alongside seasoned professionals. Born in Evanston, Illinois on Oct. 25, 1920, Nee graduated from the University of Minnesota and, following service in the Merchant Marine during World War II, received his masters degree from Hamline. Krenek, the innovative composer and Nee’s mentor, drew on influences ranging from Stravinsky and jazz to Arnold Schoenberg’s twelve-tone technique, which avoid fixing a piece in a particular key. Nee spent one year as a Fulbright Scholar in Vienna, where he studied conducting with Hans Swarowsky. He also studied at Black Mountain College in North Carolina with composer Stefan Wolpe, in Zurich with conductor Hermann Scherchen, and at Tanglewood music center in Massachusetts with conductor Robert Shaw. Nee became music director of the Civic Orchestra of Minneapolis (1953-67), director and co-founder of the Minnesota Opera (1963-67), and assistant conductor of the Minneapolis Symphony Orchestra under Antal Dorati (1959-60). He was music director of the New Hampshire Music Festival from 1960 until 1992. He chaired the department of music at UCSD from 1971 to 1974, and conducted SONOR, a resident ensemble that performed experimental music by UCSD composers. 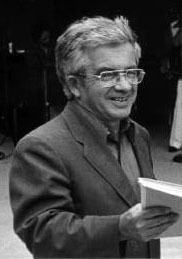 Erickson’s piece “Auroras” was dedicated to Nee and premiered with Nee conducting the American Composers Orchestra in New York City in 1984. Nee also commissioned Erickson to compose the piece “Rainbow Rising,” inspired by a rainbow that appeared in Encinitas, where both Nee and Erickson lived. In 1988, Nee was among a contingent of UCSD composers and performers including who made a strong showing at Darmstadt, the highly regarded music festival in Germany. Nee presented a lecture on “New Music in the United States” and conducted performances of music by UCSD composers. Nee welcomed renowned composers such as John Cage, Toru Takemitsu and Iannis Xenakis to UCSD for residencies that provided valuable experience to UCSD’s promising young composeres and performers. He conducted a performance of Xenakis’ “Thallein” during the Greek composer’s visit in 1991 that’s included on a 1994 CD of music by Xenakis. Nee retired from UCSD in 1991, but remained active until his death overseeing the Tom Nee Commission, awarded each year to a graduate-level composer whose new piece is performed each spring by La Jolla Symphony & Chorus. In May, Nee attended the premiere of “Snow in June” by UCSD grad student Kuei-ju Lin.